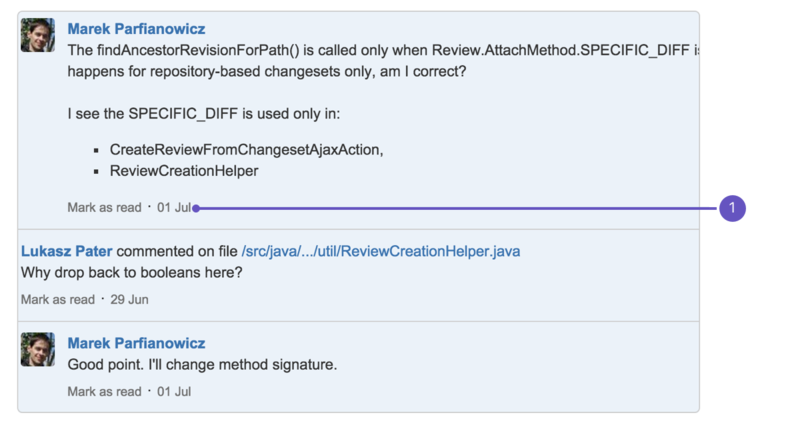 Comments are at the core of the review experience – reviewers use comments to record discussion around suggested and required changes to the code. 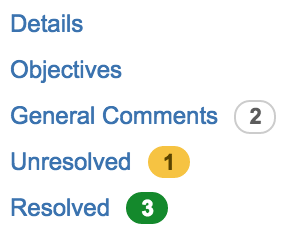 Comments can be added at the level of a review, a file, or a line. Of course, you can also reply to comments. The Review Activity shows all the latest comments on the review, so it's easy to catch up on the review, or to find outdated or hidden comments. The bubble beside the Activity link shows the number of unread comments. Click Mark as read or Mark as unread (or use the 'm' keyboard shortcut) to toggle the comment status. To see the comment in context just click it (or press the 'return' key) to go to the file where the comment was made. The number beside a filename, in the left-hand panel of a review, indicates the number of comments on that file. Click General Comments (in the left-hand panel), and simply type your comment (under 'General Comments'). Click on the file in the left-hand panel, then click Add a file comment (just above the source code listing). 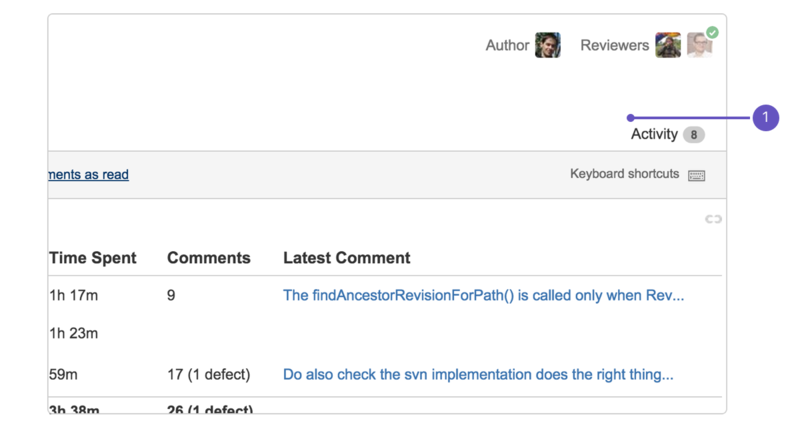 Click on a line of code in the displayed source file of a review. You can click and drag to select multiple lines, and click individual lines to select or deselect them. The comment will appear in the source at the last line selected. Hover over the comment to see the lines to which the comment applies. To select text on the page without adding a comment, hold down the Alt key while dragging the cursor. To reply to a comment, click Reply at the bottom of the comment. Only people with the 'Comment' permission can add comments. A comment can only be deleted by the author of the comment. Read about flagging defects too. You can save your comment as a draft and then edit it later. When you complete the review, you will be prompted to post, discard or edit any remaining draft comments. 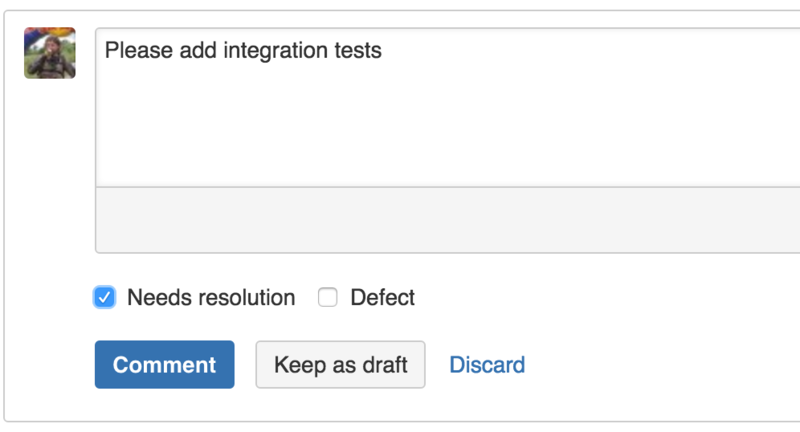 You can use comments to track tasks that still need to be done for a review. Simply mark the comment as needs resolution.